Delivered in a cotton dust bag. Free ground shipping on France. This bag is handmade by the designer, Alice Watier, in her Parisian workshop. AW Atelier Paris proposes unique bags and limited series made in France by the designer Alice Watier. 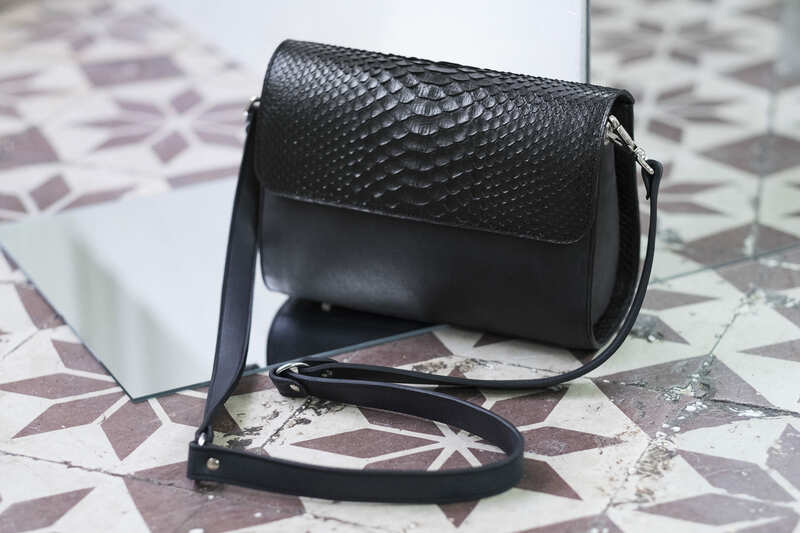 Buying an AW bag, like the black calfskin and python Joan bag, is choosing to wear a handmade design, a classic yet stylish piece, that will soon become a must-have in our wardrobe. A model is sold out? Feel free to send an email to aw.atelier.paris@gmail.com, the same leather might still be available. You don’t find the bag of yours dreams? As the products are all handmade in Alice’s Parisian workshop, you can adapt an existing model to your own taste by choosing the leather and color. • Always store your AW bag in a cool, dry location in the dust bag provided. • Avoid direct sunlight, excessive heat and dry conditions. • Avoid moisture and excessive humidity. • Waterproof the leather to protect it and avoid color change. • Avoid water and fatty substances.